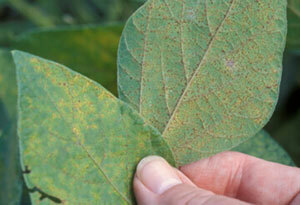 It has been several years since soybean rust has been confirmed in Missouri. But it would be a mistake to forget about this disease or think that it will never be a problem in the state. This is year when growers in the southern part of the state, especially southeast Missouri should be scouting for the disease and paying attention to reports from southern states as well as to the weather. There are factors which could lead to the occurrence of the disease in Missouri this year as well as factors which make it unlikely that even if the disease did occur it would cause yield losses. Factors increasing the potential for soybean rust include the earlier than normal development of soybean rust on soybeans in the southern United States. Thus far in 2013, soybean rust has been reported in 24 counties in Alabama, 18 counties in Georgia, 18 counties in Florida, 12 counties in Mississippi, 10 parishes in Louisiana, 7 counties in South Carolina and 2 counties in Arkansas. 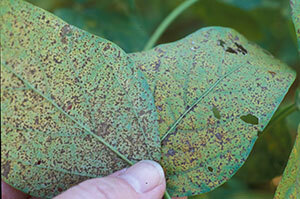 In many of these areas, soybean rust occurred 2-3 weeks earlier than normal. The IPM PIPE web site can still be accessed through https://sbr.ipmpipe.org for current information on the distribution of soybean rust in the United States. A second concern is that fact that late planting because of wet conditions last spring means that the soybean crop in Missouri is behind normal. If weather patterns occurred that would carry rust spores from the south to Missouri, there might be more fields in susceptible stages of growth. However, for soybean rust to develop here inoculum from the south must reach fields in the state and weather conditions here need to be favorable for the disease to develop. Although the hurricane season is just reaching its height there are not currently any active systems in the Atlantic Ocean. The prevailing weather patterns for much of the state are not conducive for wind-blown spread of spores from the southern United States to Missouri. And most of the locations were soybean rust has been found in 2013 are too far east to provide inoculum to most of the state (the exception being the southeast corner of Missouri). Then the current environmental conditions are not very favorable for disease development even if spores were to reach the state. Favorable conditions would be frequent rain, overcast days and moderate temperatures. After a very cool start to August, the temperatures have climbed and the forecast seems to be for a continuation of hot, dry weather. Once soybean plants reach the R6 stage of growth, yield loss from soybean rust is less likely to occur. Although it is possible that soybean rust may reach Missouri this season (especially southeast Missouri), it may not arrive in time to cause significant yield losses and/or weather conditions here may not be conducive to the buildup and spread of the disease even if spores do reach the state. Bottom line it would be wise to be alert for soybean rust, to scout fields and to watch the IPM PIPE website for further information on the distribution of soybean rust.